A new site has recently opened up in SL, owned by an Australian media company Telstra. They have recreated a number of major landmarks, such as the Sydney Harbour Bridge and the Sydney Opera House. When I visited the site, I was interested to see that the basement to the Opera House contained an art installation by Adam Ramona. 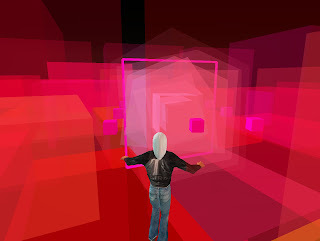 An immersive collaborative audiovisual environment for Second Life. 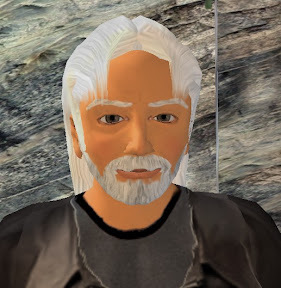 Using many of the possibilities unique to the Second Life medium, A Rose Heard At Dusk is a participatory artwork that turns visitors into performers. It was designed specifically for the cavern space under the Opera House on Big Pond Island. The work is designed to be "played" by visitors avatars. Walking, flying and jumping through the space, avatars create a unique audiovisual composition, different every time. Colours and sounds combine to create a spatially immersive musical and visual experience. The work can be played by single avatars, but it really comes alive when friends play it together. It blends the different meanings of "play". By playing in the space, visitors are actually playing the space like an audiovisual instrument, creating endless variations of sound and vision. It looks different at different times of day, the light reacting differently with all of the translucent colours. It sounds different from different positions - all sounds are attached to shapes in the space, so some sounds stay still while others move. Combined with the movements of visitors avatars, this creates an endlessly changing immersive audiovisual experience." This really begins to exploit some of the unique characteristics of the SL environment. As the description says, flying through the work causes it to emit a range of wierd electronic sounds. It is an interesting experience, though to be fair it did remind me of a 1970's sci-fi programme! What drew me to the work was a previous experience of Ramoa's work at the location "Ramonia" on the island of Marni. Here he created an installation comprising a 16x16 grid, with flexible blocks hanging in the sky above each square. Walk through the piece, and the flexible strips act like chimes as you move them. What makes the piece even more interestng is that each square has an associated word which is spoken as you pass over it. Start walking backwards and forwards in lines, and you can almost hear complete sentences. Here's a picture of Team Mascot, with the sculpture in the background. I had a wonderful time a few weeks ago visiting this piece with a number of friends. Our avatars were running through the work, seting off words and chimes as they went. It is hard to imagine just how such a piece could have been created in Real Life, and if it could, just how much it would cost. In SL, however, it is a simple (!) case of scripting and programming. 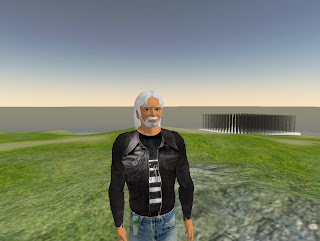 Heres a link to another review of Marni in "New World Notes", with more photos and a SLURL.